Naitasiri head coach Ilaitia Tuisese Jnr said Namosi were a champion side but they took their chances to come out with a win. 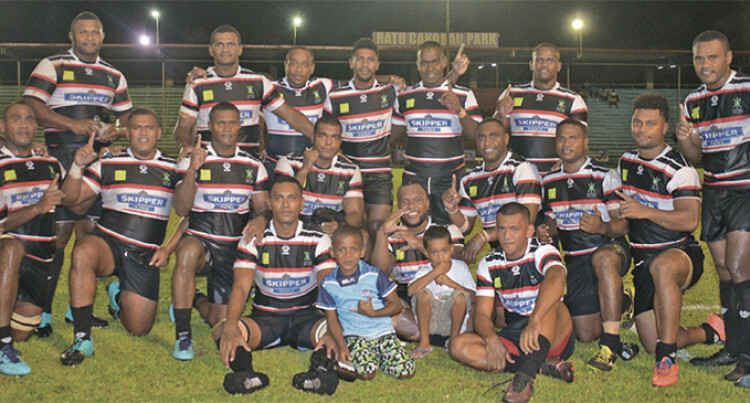 Qaqa Naitasiri rugby team after beating Namosi 24-21 in the 2019 Skipper Cup Premier opener at Ratu Cakobau Park, Nausori on April 12, 2019. Qaqa Naitasiri survived a last minute onslaught from Namosi to scrape through with a 24-21 win in the 2019 Skipper Cup Premier opener at Ratu Cakobau Park, Nausori last night. “There are other areas we’ll try to work on for our future games,” he told SUNsports. Namosi head coach Akuila Nasi said they had a late start. “We came back in the second half but it was too late,” he added. conversions before Namosi struck back with a try to Netava Koroisau with Serupepeli Vularika’s conversion keeping the scores at 14-7 at halftime. Flying Fijians half-back Frank Lomani controlled play well for Naitasiri as he set-up Inoke Tuisese to dive over for the third try with Douglas conversion missing as they extended the lead to 19-7. Lomani copped a yellow card as Namosi fought back but Naitasiri supporters jumped for joy when Emosi Vunivasa scored their fourth try to leave the scores at 24-7. Namosi regrouped and had a penalty try to narrow the deficit at 24-14. This was before Vularika scored their final try and added the extras as they trailed 24-21. Other results: Naitasiri Women beat Namosi Women 27-3 while Naitasiri Under-19 beat Namosi U19 29-3 .